Vermont is a beautiful state. Flowing rivers, rolling mountains, shimmering lakes and an abundance of farms just begging to be photographed to grace the covers of magazines. 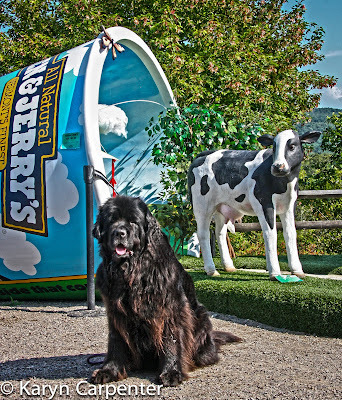 But, one mecca that few visitors can miss is the home base of Ben and Jerry's Ice cream. I visited 10 years ago and, after my factory tour, picked up a bumper sticker that says "If It's Not Fun, Why Do It?" I loved that sticker and got lots of comments and smiles from displaying it. When I sold my 20 year old Subaru, the sticker went with it and I have been unable to replace it. But, sure enough, the Ben and Jerry's gift shop still stocks it, next to ice cream scoops, T-shirts about being groovy and magnets with cows on them. I now have THREE bumper stickers so I won't be without again. Arayo was unable to go in the building but stayed outside in the shade while I did my purchasing. As soon as she and my friend, David, sat down, the Ben and Jerry's staff was there with a big bowl of water for her. (Unfortunately, though, no ice cream!) She was almost as big of an attraction as the line to purchase ice cream cones. 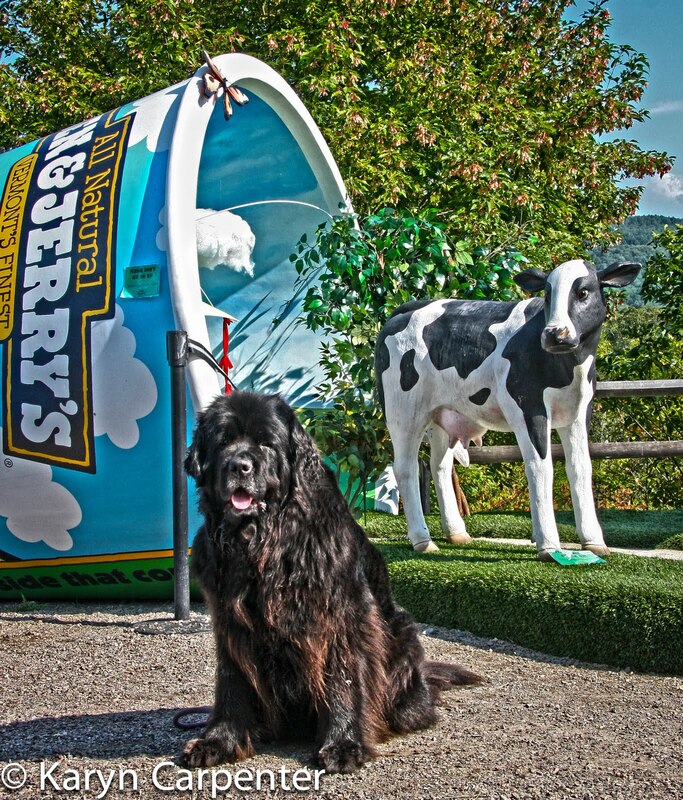 Photo: Arayo poses with cow and ice cream container at Ben and Jerry's. Oh my gosh - I've been there! Spent a week in Stowe a few years ago. Every night my friend & I ate a tub of icecream. Just passed it back & forth between us! Can't believe they wouldn't offer Arrayo a scoop! Still looking forward to seeing you in NS.